A large part of our parcel delivery business takes place at a national level. We offer next day, door to door direct delivery services to every county in Ireland and Northern Ireland and our prices are among the most competitive with prices starting at just €12.95. But that is only the start of our offer, the most basic service. 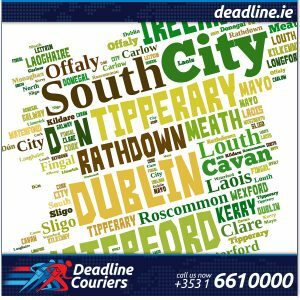 What makes Deadline Couriers on of the Ireland’s leading transport and courier company is our ability to supply more specialised services. For example, we offer timed deliveries to specific locations (ie: 9am delivery to Belfast), and a variety of vehicle sizes to suit any size load, even with our side loading trucks for those very awkward consignments. For those requiring even more urgent services, we can also organise same day delivery throughout Ireland and we can do all this on a one off basis or as schedule service to and from specific locations even managing special vehicle and driver requirements. So we are not just a courier company but parcel delivery and transport specialists, and we are looking forward to hearing from your own special requirements.